Feature:The material is very comfortable and breathable/Long Sleeve/Solid Color/Cowl Collar/High Stretchy Kintted Fabric /Pull On closure /makes you feel comfortable fit. This hoodie is the perfect mix between classy and casual and it really gives you a unique, feminine touch. This is a very comfortable sweatshirt.it is very soft and comfortable and it looks really cute with leggings or jeans.The quality of materials and design are top notch as well as seaming and stitching. Sizes:Please be advised to see our size chart for the most accurate fit. 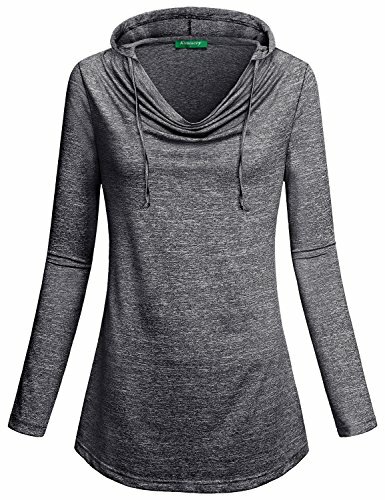 Kimmery Hooded Sweatshirt really gives you a unique,feminine touch,and the hoodie looks great with leggings or with jeans. .Ladies,This sweater is super soft,pleated and long sleeves for any kind of weather you will find with this type of material whether hot or cold or just in between, it works for any day! .The Stretchy fabric is very Comfortable to wear, Actually fit you. .The Sweatshirt really gives it a unique, feminine touch, and it looks great with leggings or with jeans. It is just long enough to completely cover your behind from the back. .This hoodie is perfect for your workouts. It fits really well and the material isn't too thick or thin. .There are your go-to,wardrobe staple! L:---- Length--78cm/30.71" Bust:96 cm/37.80" Sleeve:61cm/24.02"
Best Service:If you have any questions please contact us, we will give you the best service. Note:if you have any questions about the size, please feel free to contact us.